NEW DELHI: PV Sindhu has won India’s second medal of the 2016 Rio Olympics, but it isn’t the one she, her coach P Gopichand and all those who tuned into the gold medal women’s singles badminton match at the Riocentro on Friday wished for. Sindhu, tenth in the global rankings, lost to Spain’s Carolina Marin, ranked No 1, 21-19, 12-21, 15-21 to settle for silver. Defeat will sting Sindhu, for she had rallied superbly to come back from 6-11 and win the first game, but it needed something far greater to beat a champion like Marin, who has done more for Spanish badminton than Rafael Nadal has for tennis. Marin dreamt of an Olympic gold in Rio de Janeiro and made it a reality with some high-quality badminton. Sindhu can carry her head high. Indeed, it is a remarkable achievement for the 21-year-old shuttler at her first Olympic games, coming as it did with five wins in a row, the last two of which came over the world No 2 and No 5 respectively. On the biggest day of her career, Sindhu never stopped fighting and has won the biggest prize in the history of Indian badminton – an Olympic silver, to go past Saina Nehwal’s bronze four years ago in London. Let us treasure Sindhu as long as she chooses to grace the badminton court. Sindhu, the last of India’s shuttlers at the Games, struggled during the initial exchanges, in particular against some lovely drop shots from the left-hander. Down 3-7, then 5-8 and 5-9, then 10-13. There was Sindhu for a period, at once on her knees, made to look uncomfortable, her brow furrowed as she looked at her racquet net. But she fought hard, reducing twice the deficit to a solitary point as Marin committed a flurry of errors. Marin smashed one to lead 19-16. Surely the game was hers? No, no. 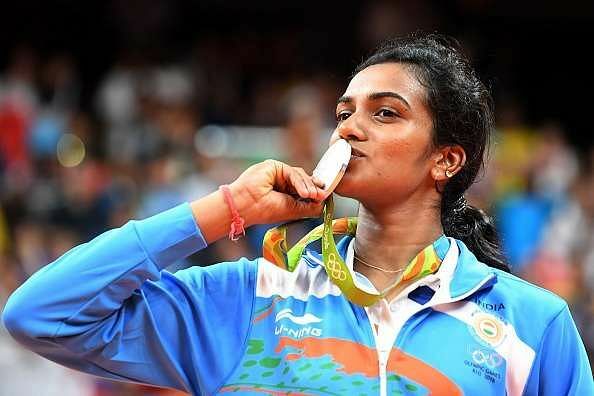 Sindhu persevered, returning serves with precision and power, and the scoreline went from 17-19 to 18-19 to 19-19 and then 20-19 as chants of ‘jeetega bhai jeetega’ reverberated from the sizable Indian support in the stands. It was nail-biting badminton. Then Marin messed up a return against a superb flick from Sindhu, forced to turn as she ran backward, and the shuttle flopped in her half. Sindhu roared, pumped her fists. The first game was hers. But Marin is a champion, and went up 4-0 in the second game, then 8-2. Her shots and returns regained a heartbeat, she pushed Sindhu into errors and the momentum was snatched back. A nine-point advantage was punctuated by a ferocious smash to which Sindhu had no answer. The rest of the game saw Sindhu frustrated repeatedly, and despite scattered moments of aggression she fell behind 12-21. The decisive third game initially went Marin’s way 6-1, but Sindhu kept hitting back. Three straight points reduced the deficit to two points (10-8), which turned into 10-10 after a teasing, gasp-inducing rally full of brilliance. An error in judgement from Sindhu put her back 14-10, then Marin won a review, 16-12; a shot went out, 16-14; Marin smashed into Sindhu’s body, 17-14; a dab past Sindhu and it was 18-14 and that was the shift that Marin needed to round out a dominant win. Sindhu never gave up, but her opponent’s experience and pedigree was simply too much to be overhauled.